1. Inserting a barrier in a box is not a measurement. 2. I think you are right that weighing the separated boxes represents a measurement (you find out that the particle is in the heaviest box). You don't need to weigh it, moving it is enough. Accelerating the box and recording the force needed to get that acceleration gives you the mass. Accelerating the box changes the state of the particle inside and the superposition is lost. a. You need your particle to enter the box from the opposite side so that it has an initial momentum parallel to the separator and perpendicular to the screen. If not, there is no reason for the particle to get in that direction. You will not get two spots and neither interference fringes, but some random detection events anywhere on the screen or the particle might even remain in the box. b. If the box is very narrow (in the direction of particle's motion) you will get interference, with or without the separator. It is basically the double slit experiment with a hollow slitted wall. b. If the box is large in the direction of particle's motion and the separator is present there is less and less overlap of the waves behind the box so the interference will continuously fade (it only disappears completely for an infinitely large box). But the collapse only takes place when the particle is detected at the screen, not when the barrier is inserted. 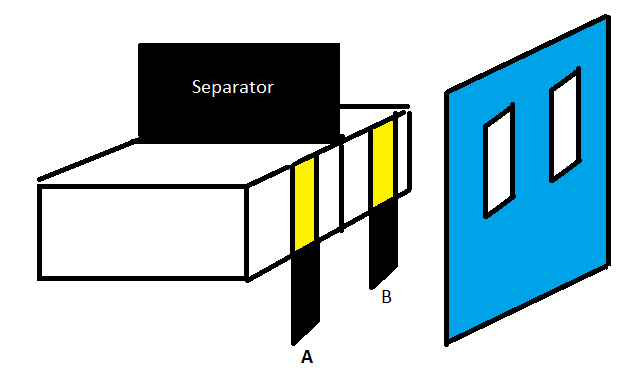 Even for an infinitely large box with the separator in place the particle is in a superposition of the two possible paths (A and B). 4. I still do not see the relevance of all this in regards to the locality dilemma. Even if you are right and the proposed experiment (in the previous post) with mobile boxes destroys the superposition there are many ways in which to prepare a particle in a superposition of two or more distinct locations. I am looking forward to see your resolution of the dilemma. Lubos didn't provide one, either. I wrote a comment on my blog before I saw the second part of your blog post. In that comment, I wrote that it's trivial to make an experiment you want - and it's been done hundreds of times. 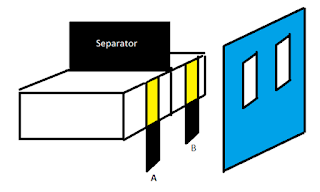 In a double slit experiment, you simply divide the space to 2 parts, with 1 slit on each side, for a picosecond during the time when the particle is moving through the slit(s). You say that this insertion of the wall amounts to a measurement of the which-way information and the interference pattern goes away. I am saying that every sane person knows that this claim is totally ludicrous. The particle has 0% probability to be near the plate that separated the space, so obviously the presence of the plate doesn't make any difference at all, and the interference pattern will still be there. There's no disappearance of the pattern or decoherence or anything of the sort. "The particle has 0% probability to be near the plate that separated the space"
Not true, the plate is located at the interference maximum so the probability of the particle to be there is large. If the plate is large enough the interference disappears. Florin didn't say the plate remains for a picosecond, but until the particle is detected at the screen. If the plate is inserted and removed before the particle is detected, the interference might remain but this was not the experiment Florin proposed. I am not taking a realist position or any ontology here: the role of the observer is still paramount. There is a very precise and *unique* mathematical way in which an observer can be introduced. My claim is based on my definition of "observer" which is more general than what is usually assumed. A measurement takes place when a certain equivalence relationship is broken. The very presence of the wall breaks the equivalence and this results in a wavefunction collapse. In turn this makes the interference vanish. Your comment is reminiscent of Afshar experiment setting. I say cut the box first then open the slits, not when the particle is in flight. By the way, the best criticism of Afshar was done by Ruth Kastner IMHO. You're really a completely clueless crank, Florin. If you place some objects (a wall) at places where a particle is certain not to be located, the effect on the particle's future behavior is obviously non-existent, so the interference pattern cannot disappear. It follows from locality. It's really a completely commonsense example of locality - only unhinged loons may misunderstand it. "If you place some objects (a wall) at places where a particle is certain not to be located, the effect on the particle's future behavior is obviously non-existent"
Collapse is not a dynamical process, and you objection is bogus. This is interesting, but I doubt that splitting the box amounts to a measurement. Here is an argument. Suppose you send a particle which is split and goes through both arms (fig 1). The arms are considered to be pipes, so the particle is isolated while inside an arm. Then this amounts to the particle being in two separate boxes. But then, the two "halves" interfere and combine again. Now, you may argue that the pipes are not boxes, that they have open ends. However, let me modify the Mach-Zehnder device, by adding separators at the ends of the pipes. - After a time shorter than it takes the particle to go through the pipes, open the "out" ends of the pipes. Now the particle can interfere with itself and combine back (fig. 4). If I still haven't convince you, at least you have an experimental setup that is more practical to implement. In your experiment proposal, the particle is in the box, but to have observable interference, you need to have well-defined frequencies. It is difficult to store the particle in the box while keeping its frequencies and phases, and therefore this makes impossible to predict how the interference looks like. My proposal allows you to do this, and to predict the interference effect, in this case it is simply that the particle hits the target in ~100% of cases. If someone doubts that it is practical to make this experiment, here is another modification. Simply replace the separators at the ends of the pipes with helices, that close the pipes periodically. The length of the pipes can be calculated so that we can be sure that the photons can get out and while inside the pipes there is always a moment when the pipes are closed. Now on the interferometer example. In the case of helices the interference happens as well but you'll see in a sec why I say so and I (kind of) disagree with your first post. On the first post consider this: cut the two arms in half and "bottle up" the photon with two mirrors at the two ends while the photon is in flight. Send one half to London and another to Tokyo. We know that opening them will result in the photon being discovered either in London or in Tokyo. But can we know in which half is the photon without opening them? Yes we do. The moment the photon reaches the end and bounces off the mirror, it will create a recoil on the mirror which will allow its detection. Effectively the end mirror acts as a detector and once this happens, recombining the two arms will no longer result in interference. So for your argument with the particle propagation, as long as we do not know the "which way" information the interference will happen. But when the particle becomes trapped the interference no longer happens. Quantum mechanics is contextual: change the experimental context and when a certain equivalence is no longer possible will result in collapse. this is the gist of my argument. PS: Lubos objection was trivial to counter, but it took me some time to figure out the answer to your particle in flight challenge. Good to hear from you too (well, I hear from you more, because I am watching your posts, but I didn't blog for long time). I don't think bouncing on the mirror is a detection, unless you measure the momentum change on the box caused by the bounce. If the bounce constitutes a measurement, then the simple interference experiment with the Mach-Zehnder in Figure 1 will never result in interference. Because there you have a bounce inside the arms, on the mirrors at the corner. It is not frontal, but I think it is still a bounce. And if you wish, we can complicate the Mach-Zehnder device with a frontal bounce at the corner of the arm, and the reflected photon can then be bounced at 90 degrees with a half-way mirror at 45. In fact, frontal bounce takes place in the Michelson interferometer. Also there is bouncing in the two-slit experiment. Knowing the momentum destroys the interference (see Bohr–Einstein debates, discussion surrounding Fig. C.
"If the bounce constitutes a measurement, then the simple interference experiment with the Mach-Zehnder in Figure 1 will never result in interference." "I don't think bouncing on the mirror is a detection, unless you measure the momentum change on the box caused by the bounce." - I don't agree. The "which way" information is obtain by weighing the arms of the interferometer, not by the momentum transfer. One closed arm is heavier than the other. You said "The moment the photon reaches the end and bounces off the mirror, it will create a recoil on the mirror which will allow its detection." What I said is that bounce by itself doesn't cause collapse, unless you measure its effect, which you said is the change of momentum of the mirror. Weighing is another way to measure in which arms of the interferometer, or in which box, is the particle. To show you that the bounce itself is not a measurement, I explained that bounce happens both in the Mach-Zehnder, and in the Michelson interferometers, yet the interference is not destroyed. I think we agree in the end. Bouncing by the mirror at the end causes the collapse not by momentum measurement but by Energy-Time uncertainty relationship: bouncing buys time to allow the energy uncertainty to be reduced to the point it will reveal the existence or not of the particle. I don't understand how you apply the energy-time uncertainty so that for my figure 1 bouncing doesn't cause collapse, but for the experiment in figures 2-4 it does. I would be interested if you have more details, in a paper you wrote or perhaps in a future post. You made me curious with this one. Lubos: "If you place some objects (a wall) at places where a particle is certain not to be located, the effect on the particle's future behavior is obviously non-existent" This argument would be valid if collapse would have been a dynamic process. However it is not and the argument is vacuous. Cristi: "However, let me modify the Mach-Zehnder device, by adding separators at the ends of the pipes." Adding separators acts as detectors when the particle will bounce of them. Once this happens the interference vanishes. While in flight with no interaction there will be interference, but once the transitory period ends we have the which way information killing the interference. The original example assumed a stationary case and my original argument/prediction still stands. The Mach-Zehnder interferometer experiment works, although there is a bounce inside its arms (see Figure 1). It seems to me that you are not interested in having an honest debate anymore. You didn't answer to any of the points I have raised (the fact that the experiment is not doable as presented and the irrelevance of this experiment in regards to locality dilemma). I don't feel compelled to participate anymore. Sorry for the delay, I planned to answer yesterday but I was simply too tired and went straight to bed. Andrei: I don't get how I could have offended you, but oh well, it's a free village. Cristi: so if I understood you correctly, say in the Bohmian interpretation you can "bottle up" the quantum potential in one arm of the interferometer, ship this arm to Tokio and back, recombine, and still get the interference? That would make up for a nice business proposal: "empty" bottles full of quantum potential for sale. ha ha.